We go through a lot of trail mix in our house; probably because we like to hike and it's an easy snack to pack for hitting the trails. We used to purchase pre-made trail mix but I realized I could make a double batch for just about the same price. It's so easy and tasty! I just dump all the ingredients in a giant bowl and mix together! Soo easy! And I love that I can mix up the ingredients anytime I want. We've tried craisins with dark and white chocolate baking chips. We've mixed up the flavor of M&M's too and haven't found one yet that we don't like. I divide the giant batch into two zippered storage bags and pop them in the pantry. I've toyed with dividing them up into single serving sized containers but haven't yet. I do have to warn you this is not Weight Watcher's friendly but it really does hit the spot when you want something salty and sweet at the same time. Oh, this looks so yummy! I love trail mix for hiking! It satisfies both that sweet and salty craving. 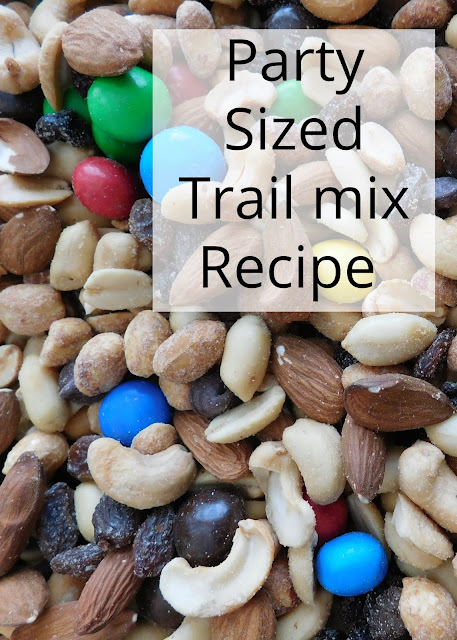 What a great trail mix for a party, this looks awesome! Thanks so much for sharing your post with us this week and hope you have a very special weekend!